It may not be an epic grudge match like the co-main event, but the rematch between Robert Whittaker and Yoel Romero has this writer salivating. Both their styles are reminiscent of traditional martial arts (yes, karate is life). You have to consider that these two athletes fights have a similarity to the stop and start, explosive movements of what we see in karate, though Romero seems to rely more on a whatever works approach to his striking. So how do these two match up exactly? Yoel Romero is the definition of explosive. You look at the man and his physique seems to have more in common with a superhero than a fighter. This isn’t a bodybuilding competition, but Romero looks the part and backs it up with his devastating performances. His bouncing in and out style is punctuated by some explosive rushes that are so fast and destructive, and his opponents fail to see the attack coming until it’s too late. While you wouldn’t necessarily call Romero a technical striker, he has adopted a style that plays into his athleticism. He doesn’t usually come forward with jabs and isn’t the greatest when backing up, but his wrestling ability has given him a sense of timing. He knows when to explode and when he should retreat. In between then, he lulls his opponents to sleep with feints and fakes until lulling them to sleep with a flying knee or blitz. Many of his attacks are set up from that in and out bounce which works to his benefit and his detriment. 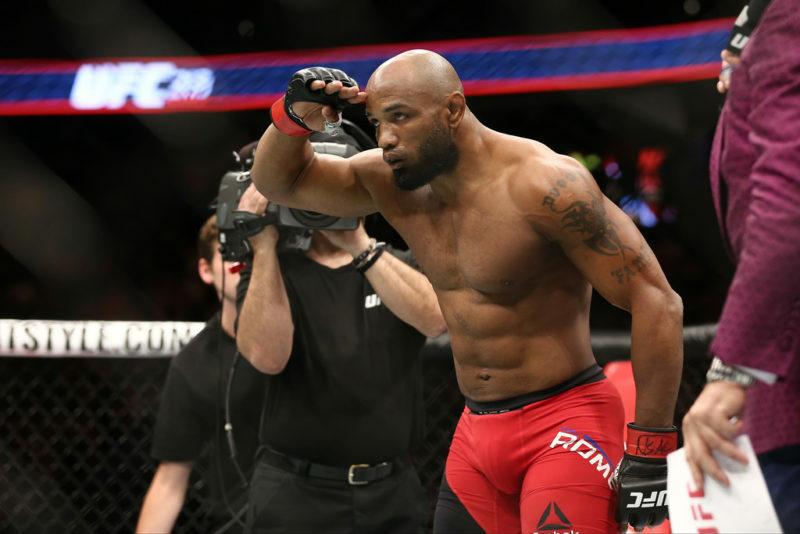 To secure a victory in this rematch, Yoel Romero should look to take a more deliberate approach to engaging. 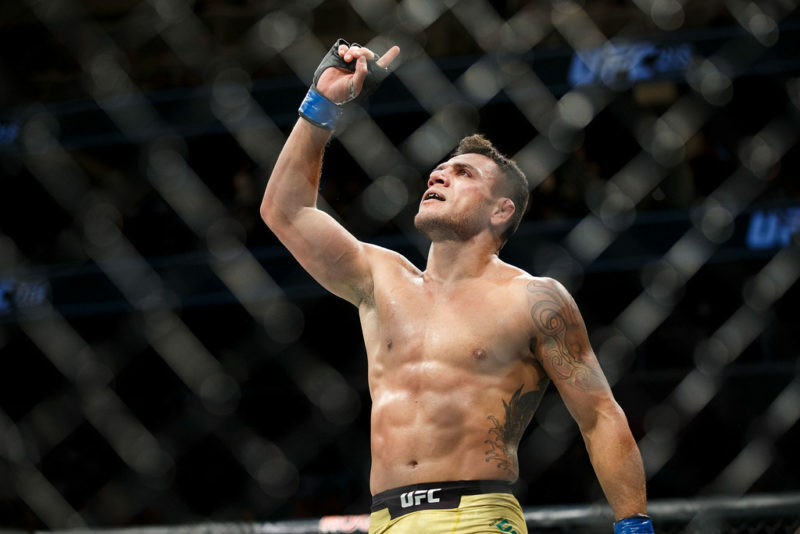 Where he was high energy and overly explosive in their first match, Romero should look to conserve himself as he did against Luke Rockhold. 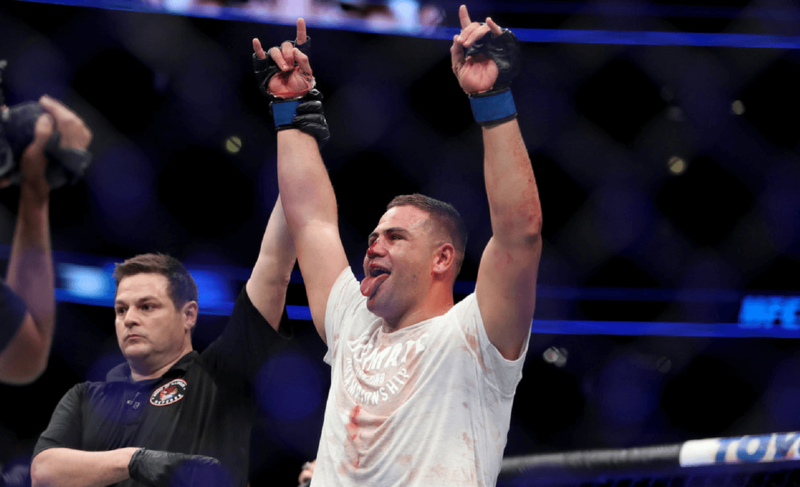 The low line sidekicks should make a return, but since Whittaker will be prepared for that, especially with how effective they were in the first fight, Romero should also use it in multiple ways. One, perhaps most important point, it should be used to keep Whittaker at a distance. Rather than lunging too far forward with the strike to score the most damage, Romero should just throw it out there to keep Whittaker from exploding forward. Secondly, he should use the set up to the side kick as a feint to close distance for either a blitz or a takedown. 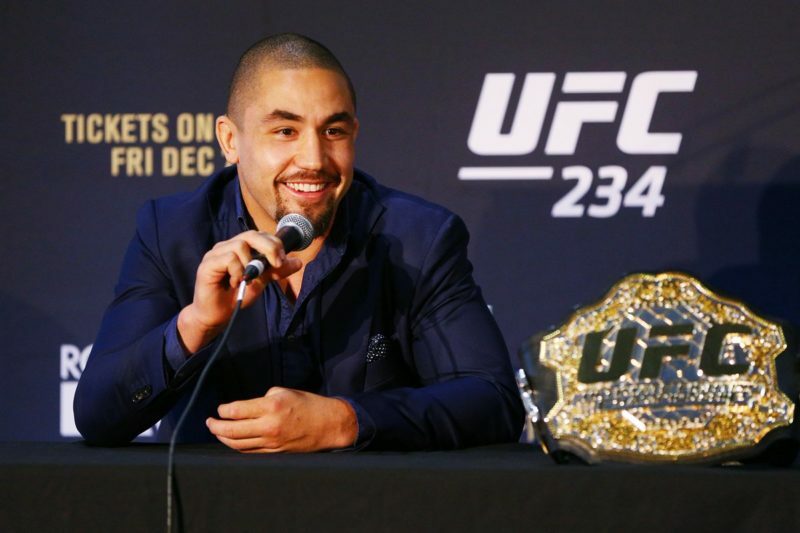 Keeping Whittaker from catching on as to when the legitimate rush will come will be paramount to catching the champion off guard. From the outset, I’d tell Romero not to allow Whittaker any space. Rather than attack, he must corral Whittaker against the fence with feints and the threat of explosive rushes. Playing the counter fight could also play to Romero’s strength so telling him to aim small, as in nothing overly high risk, will preserve energy and get his opponent in anticipation mode. Explosions should be saved for when there are 30-45 seconds left in the round, if it gets that far. Ultimately, it will turn into a game of cat and mouse where takedown attempts, mostly against the fence, will rule the day. Clinch work against the cage will also pay dividends and help to sap the strength of the champion, so being too greedy for takedowns is unnecessary. Beating him up in the clinch should be sufficient enough to open up more offense. Robert Whittaker celebrates after his bout against Yoel Romero in their interim UFC middleweight championship bout during the UFC 213 event at T-Mobile Arena on July 9, 2017 in Las Vegas, Nevada. The UFC middleweight champion has been on the shelf since last July when he bested Yoel Romero. Now he’ll have a sense of deja vu as he sets to the task once again. 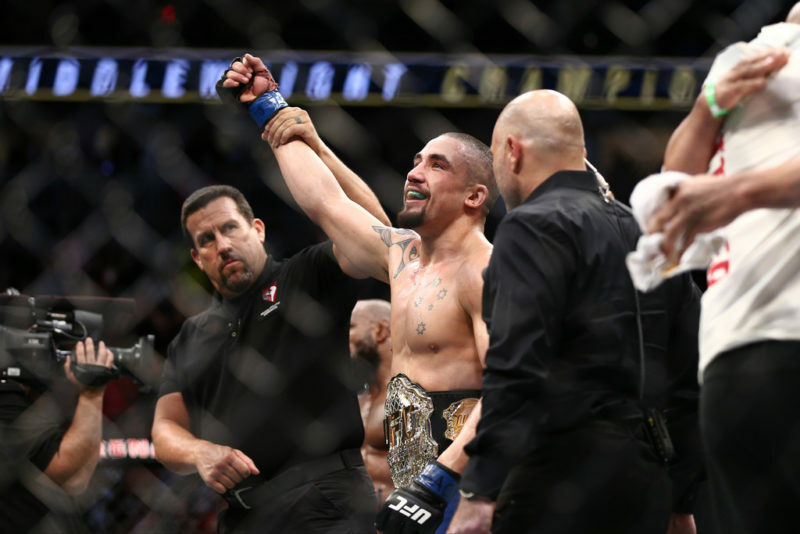 Whittaker coming from a traditional martial arts background has been able to capitalize on his in and out movement. Whittaker has sharp eyes and slick timing, both attributes we see in karate training. While he mixes in boxing nicely into his game, particularly his venomous jab, Whittaker can bounce in and out of danger much like Stephen Thompson and Lyoto Machida. His jab sets up a good amount of his offense, though he will blitz with a right cross and follow it up with a same side snap round kick. Whittaker also keeps his hands low to get under hooks to defend takedowns as well as punch from unpredictable angles. In terms of wrestling, it’s mostly defensive, but it’s clear he’s at a high enough level where he could easily take lesser grapplers down. His defensive capability stems from his ability to twist and turn his hips into advantageous positions. In their first fight, Whittaker showed a stubbornness to get to his knees once a sprawl was unsuccessful, walk his way to the cage and use the fence as a third leg to help him stand. Considering how well the front snap kick worked in the first bout, Whittaker won’t want to abandon it here. Since Romero can’t fight all that well moving backward, it’s imperative that he puts the Cuban on the back foot. When Romero begins to do his in and out bounce, Whittaker should either move out the way ASAP or use that snap front kick to disrupt his movement. The jab should also make an appearance, though not as much as trapping Romero’s lead hand where he should launch a front kick into his midsection. Most, if not all of these kicks should be done with the right leg as he can switch between a front and round kick to catch Romero off guard. The left leg should be used for side kicks and low kicks to the calf. The front kicks can also set up his devastating left hook and uppercut which Whittaker was unable to use in their first bout. Hopping off the center line from time to time to find new angles will also help Whittaker exploit openings and get Romero backing up to the cage where the champ can piece him up. I’d tell Bobby Knuckles to assert his presence from the opening bell. Controlling the center is key to success against a monster like Romero, and it’s where Whittaker can dictate the pace and distance. I’d be telling the champion to use those feints to get Romero reacting and exploding forward with offense, a front kick if he turtles or a left hook if he drops his right hand which Romero is prone to do. 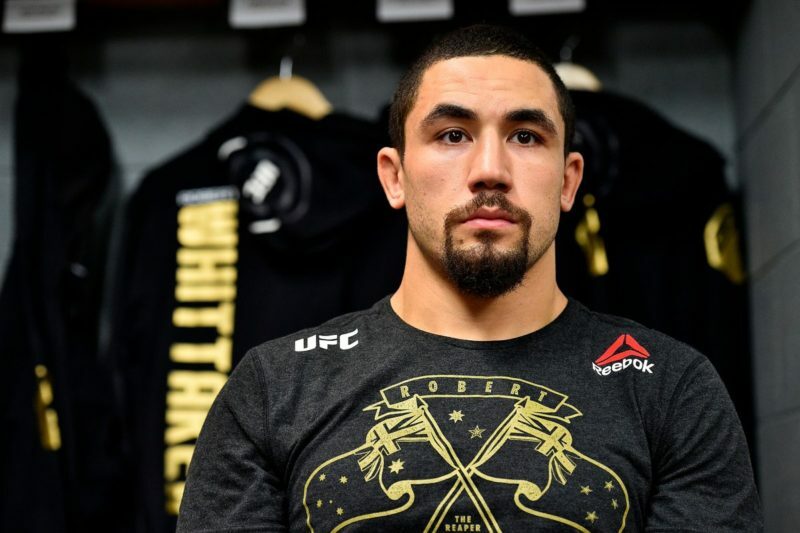 It’s all about instilling confidence, especially in a young champion, so reminding Whittaker of his tools and to be relaxed will also be important. Who do you think wins at UFC 225? Jonathan Salmon is a martial artist, writer, and editor with years of experience in the game. Follow him on Instagram and Twitter for more martial arts content.